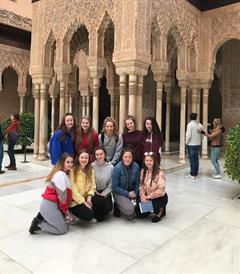 Over the Halloween midterm, twenty three students and three teachers from Ard Scoil na nDéise had the privilege of going on a school tour to the south of Spain. The trip lasted five days, and we had plenty to do! On Saturday, October 27th, we departed from Dublin airport and spent the day travelling to Torremolinos, where we stayed. On Sunday, we went to Seville. 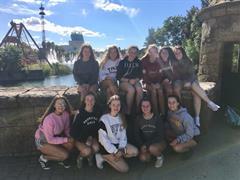 We spent the day at a theme park and we all had so much fun. On Monday, we went to the city of Granada. We got a tour of the beautiful palace and the old town. Here, we learned a lot about the history of the city. On Tuesday, we travelled back to Seville. Here, we had time to go shopping for a few hours. We then got a guided tour of the city which was very interesting. The city is full of amazing monuments and buildings. On our last day, we went to Malaga. We had a great time going around the shops. Then we visited the Picasso art gallery and had our last lunch together before heading back home. We flew back to Cork that night, after having a wonderful trip. While this was an educational experience, we all had a great time together and we have some amazing memories we will never forget. We would like to thank our teachers, Ms. O’Shea, Ms. Foley and especially Ms. O Sullivan, who organised this brilliant trip. On the 10th February the Ard Scoil girls headed off to Dublin airport to depart for their week of skiing in Andorra. It was a long day travelling. When we arrived at the hotel at 01:30am everyone went straight to sleep. The next morning we were up bright and early as we had a long day ahead of us. First we had a 10 minute bus journey to where we fitted our boots, skis, poles and helmets. Then we took a 15 minute Gondola trip to the slopes. We were introduced to the instructors that would lead us for the week. For our first lesson they taught us the basics. It was a tough two hours but we all pulled through to lunch. We had an hour and a half of resting to revive our energy levels for our next two hours on the slopes. After lunch we practiced on the green slopes improving our turns and stopping. We had a few falls along the way but everyone was eager to get up and try again. After a long day everyone went back to the hotel to get ready for a competitive game of bowling. We were glad to see our dinner and went to bed tired but happy. We were kept busy all week and every evening we had an activity such as going shopping in the charming town of Andorra, where we bought souvenirs and explored the different shops it had to offer. Tuesday we had pizza night and we got a taste of their Andorran culture. On Wednesday we all devoured crepes, celebrating pancake Tuesday back home. After the strain of a new sport on our legs and arms, we relaxed in the swimming pool, Jacuzzi and sauna. This worked wonders and really helped us to loosen out. We ended the week on a high attending a disco with many other Irish schools that were staying in the area. Everyone was sad to go and we were already planning our Sixth Year holidays!!! The week flew by, everyone was amazed by the stunning scenery and mountains. Snow fell overnight leaving us captivated by the blanket of white each morning. Everyone progressed greatly and towards the end we had many people skiing down the red slopes with great ease. 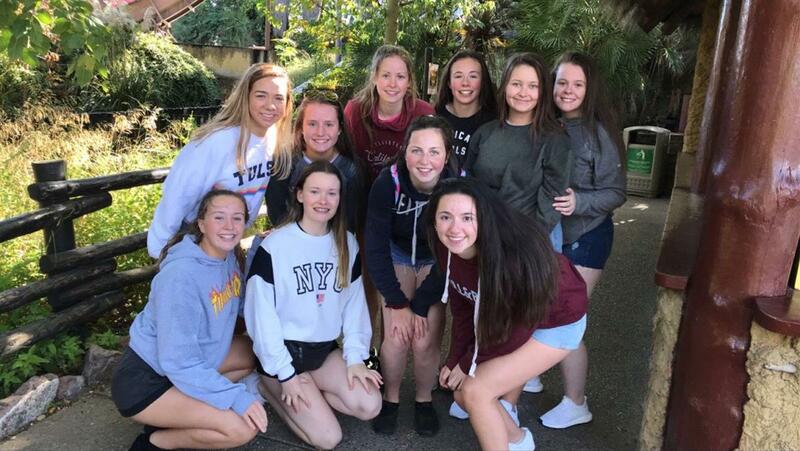 Every day it got easier and each girl would definitely agree it was a brilliant experience and one of their most enjoyable holidays.